But what if you’ve decided not to participate? Believe it or not, there are a lot of writers out there who don’t do NaNoWriMo – or at least don’t do it every year. 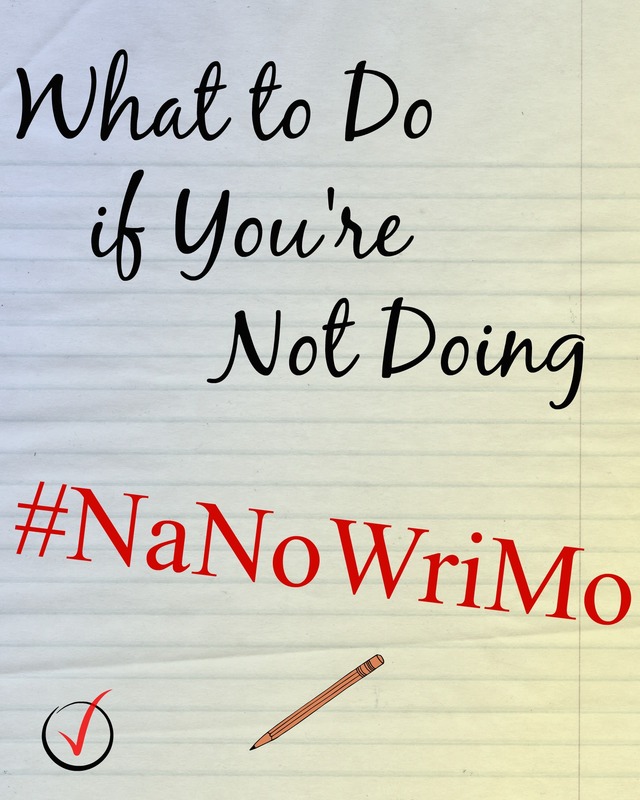 So what can you do this November if you’re not trying to crank out a NaNoWriMo novel? Writers should always encourage each other. This writing thing is hard enough with the lonely hours, writers’ block, and self-doubt, without us tearing each other down. So if anyone gives you a hard time for not participating in NaNoWriMo, just ignore them and keep on truckin’. Everyone has their own personal reasons for participating in this event, and those who don’t participate have their own equally unique and equally valid reasons for not doing so. NaNoWriMo is a fun bandwagon, but never let yourself feel guilty or ashamed for not jumping on. NaNo is all about goals. The ultimate goal is 50K words in a month, and that comes out to approximately 1,667 words per day or 12,500 words per week. That’s one of the benefits of NaNo – it gives writers a concrete goal and deadline to shoot for. But you might have some different writing goals. For example, a professional author with a book contract can’t just take a month off to write a new first draft if she’s got a deadline to turn in a revised manuscript to her editor. Maybe you’re not a professional author with a contract and a deadline (yet), but you might still have a different goal that is not compatible with NaNo’s deadline. And if you don’t have a goal but you still don’t want to do NaNo, then set yourself a goal. Shoot for writing one short story during the month of November, or two poems, or finishing that novella you started a year ago. Any goal that you set is valid if you’re working towards it. NaNo is also all about writing. For one month out of the year, even those who don’t consider themselves to be “writers” get excited about writing. You should, too! Write some songs, start a journal, write one more chapter, post a blog. Just write! Are you doing NaNoWriMo this year? Why or why not? « Another Roaring 20s Dieselpunk Adventure! Lol! You’re right. there are lots of writers who don’t oartecipate in NaNo. I tend to forget, since I’ve been partecipating for the past 12 years. Normally I ecourage writer to partecipate, because NaNo has been awesome for me. It isn’t just getting the words out. It’s the community. Cheering up each oter, the word sprints, brainstorming and the possibility to get in touch with so many people on the forums that you’d never had the possibility any other way. I had answers in the forums I’ve never have had otherwise.